Epic Floods In Texas And South Asia Are A Challenge For Aid Groups : Goats and Soda Two weeks before Hurricane Harvey struck, monsoon rains swamped Bangladesh, India and Nepal. Aid groups are struggling to deal with both disasters. A boy on the outskirts of Bogra, Bangladesh, on Aug. 20. With a reported 50 inches of rainfall, flash flooding and high, murky waters, Hurricane Harvey in Houston has gripped America's attention. But halfway around the world, another flood has wreaked havoc on historic levels. Two weeks ago, record monsoon rains hit parts of Bangladesh, India and Nepal, bringing the worst floods the region has seen in years. Over 1,200 people have been killed and 24 million affected. Relief agencies like the Red Cross, Islamic Relief and Save the Children are on the ground in both areas, juggling resources to address the crises. On its face, the humanitarian needs are the same, explains Jono Anzalone, vice president of international services at the American Red Cross, who just returned from Bangladesh, where he witnessed flood relief efforts. But for workers and volunteers in South Asia and the U.S., the conditions to deliver aid couldn't be any more different. NPR interviewed Anzalone, Minhaj Hassan of Islamic Relief and Laura Cardinal, senior director of humanitarian response at Save the Children about the situation in both disaster areas. The interviews have been edited for length and clarity. Editor's note: In investigative stories by NPR, the Red Cross was criticized for "poorly managed projects, questionable spending and dubious claims of success" after the earthquake in Haiti and Superstorm Sandy. The Red Cross has defended its record. Addressing concerns about the Red Cross role in the wake of Hurricane Harvey, a spokesperson told NPR: "We respect donor intent and assure Americans that all donations raised for Hurricane Harvey relief efforts will enable the Red Cross to prepare for, respond to and help people recover from this specific disaster." 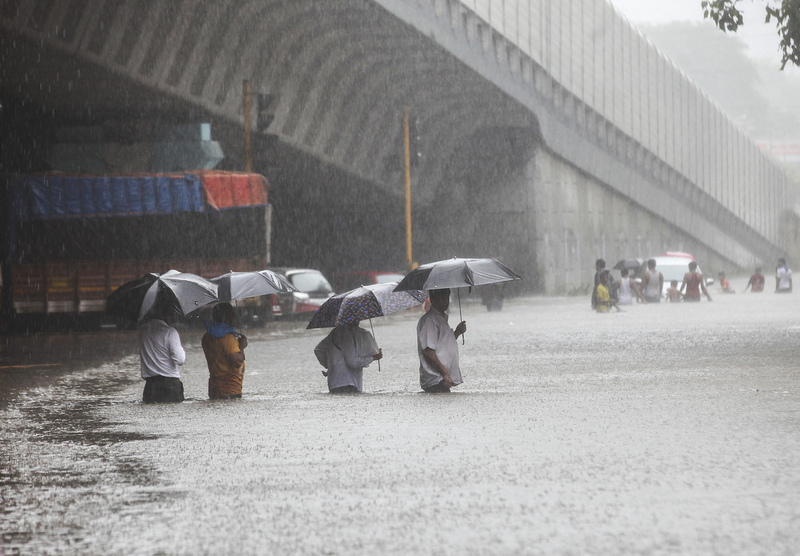 A flooded street during heavy rain in Mumbai, India, on Tuesday. Is having two flood disasters putting a strain on relief efforts? Anzalone: What is challenging is that this is just another disaster on top of four famines in Africa and the Middle East, a cholera crisis in Yemen, protracted emergencies in Syria, Afghanistan. Donor fatigue is a significant concern. When you have this many simultaneous disasters, it's hard to draw attention to any particular one. What do the floods in Houston and South Asia have in common? Cardinal: Whether it's here at home or across the ocean, children and families have been stranded in their homes. Many have lost everything. Education has been disrupted. Businesses have been closed, destroyed. It will take a long time for people to restart their lives. In some districts in Nepal, for example, 89 percent of the fields were destroyed, which has a huge impact on the agricultural sector and food security. Cardinal: Children and adults need safe places and access to food and water. Children need psychosocial support. We need to get children back in school as quickly as possible. In both places, the situation is still in the first phase: We are delivering life-saving support right in the middle of the emergency. In Nepal, the waters have started to recede, but there's another forecast of rain. Anzalone: Infrastructure. If you compare the shelter conditions in Bangladesh to Texas, as dire as the condition may seem in Texas, typically, we would at least have safe structures on safe ground — not in flood plains. Anzalone: In Bangladesh, India and Nepal every single year, things like bed nets [to keep away mosquitoes that can spread malaria and dengue], oral rehydration salts [to prevent diarrheal disease and cholera] can save a person's life. Those are priority items to distribute when a disaster like this strikes. In the U.S., it's uncommon to see the distribution of mosquito nets and rehydration salts. Even though in Texas we do have mosquitoes, we're very fortunate that the shelters have well-contained vector control [methods to shut out mosquitoes and other disease-carrying animals]. What about recovery efforts? How will those differ? Anzalone: For better or for worse, when people look at the U.S. response system, we have a very mature federal disaster response system, starting with FEMA [the Federal Emergency Management Agency]. It's a machine. Immediately before landfall of Hurricane Harvey, the governor of Texas requested aid for long-term recovery projects. You don't see that in Nepal, Bangladesh or India. In Nepal and Bangladesh, the government simply doesn't have the resources. There is no tax base to support that robust response and recovery system. Their process to rebuild is complicated by underlying development issues that are inherent in those countries. What lessons could both disasters learn from each other? Cardinal: Preparedness is key. Nepal, Bangladesh and India are no strangers to emergency. They've done a lot over the last decade: making sure people evacuate and know where to seek shelter, making sure governments are ready to support the population. We've seen that in both [Texas and South Asia]. Anzalone: And no one agency can do it alone. Aid groups work together to see where they can help. How do aid groups divvy up the work in times of crisis? Hassan: In the case of Hurricane Harvey, we are working with the American Red Cross. Everyone knows their responsibilities, so stepping on each other's toes is not a problem. Right now, our volunteers are assisting in emergency shelters in Dallas, providing support and counseling to the evacuees. In Bangladesh and India, we're more independent. We've had an office in Bangladesh a long time, we have roots there. What do people need right now in both places? Hassan: Right now, cash is king. Material goods aren't as effective as cold, hard cash. We've been stressing all along: whoever wants to donate, please give cash. In Bangladesh, we're giving cash cards with about $50 a person to help [flood evacuees] get back on their feet and provide themselves with the essential goods. In Bangladesh, that amount can go a pretty long way. Is one disaster more urgent than the other? Anzalone: No one life is greater than the other.